Funny how time flies. It’s been a decade since London-based soul revival band Mamas Gun struck gold with their first single “Pots of Gold” and a rolled out LP Routes to Riches, becoming a huge chart-topping talent in Japan and winning critical acclaim across the globe via word-of-mouth and Internet consumption. Since then, the five-piece unit playfully named after Erykah Badu’s 2000 disc and led by frontman and songwriter Andy Platts has evolved their sound from a blue-eyed neo-soul bouillon into something of Stevie Wonder ‘70’s splendor, even touching on celestial Prince pop with 2014’s Cheap Hotel. Of recent memory, Young Gun Silver Fox, a side project of Platts, released one of the craftiest soul-meets-Yacht rock odysseys ever with 2016’s West End Coast. But as the band reaches their first major anniversary milestone, they’ve decide to return to form, gravitating to the sounds of classic soul and cranking out a ten-track LP using analog equipment. 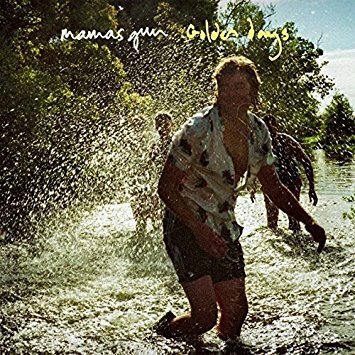 On Golden Days, the group’s fourth studio album, Mamas Gun decides to take things into their own hands by producing the affair entirely and cutting the tracks live, giving each offering a real-time authenticity. And joining Platts, bassist Cameron Dawson, guitarist Terry Lewis, keyboardist Dave Oliver and drummer Chris Boot on this adventure is Shawn Lee, the other half behind Young Gun Silver Fox, who assists with the album’s stellar mixing. The ten-track set kicks off perfectly with “You Make My Life a Better Place,” a song soaked in summery sunshine and feelgood lyrics: “Ever since we’ve been together, it’s getting better every day/And I pray it is forever, that it’ll always be this way.” It could come off as a fairy tale romance, but it also sounds like a celebration of brotherhood for the solid band. And like an endless river abundantly flowing, the rest of the tracks play like a masterclass on millennial soul: “On the Wire” resembles Curtis Mayfield swag dipped in Dap King brass; “I Need a Win” hums with Philly soul allegiance; “Diamond in the Bell Jar” blends Mayer Hawthorne swag with Alabama Shakes soul; “We” shows off the power of togetherness (“It’s better when it’s we”); and the title track is saturated in a vat of Memphis soul as Platts’ emotive crooning hits a mounting crescendo. Shawn Lee gets technically crafty with the exits of some of the songs, dropping nostalgic ticks and psychedelic overtures into the soundscape to better enhance the atmosphere. It reaches a burning finish with the closing track, “This Is the Day,” where Platts’ vocals oozes his soulful vocals alongside an intimate upright piano, a cascade of rain drops and a lo-fi production that feels like a charmed eavesdrop on a skilled balladeer in rehearsal. Although the American soul influences are highly pronounced here, Mamas Gun inserts nods to their Brit identities. “London Girls” is pretty self-explanatory, while “On the Wire” hammers at the Brexit crisis. There are no duds here. Everything is a feast over which to marvel, so picking personal favorites is certain to be a chore. And it’s obvious that Golden Days’ amalgamation of soul, carefully blended stew of ‘70’s vibes, vintage R&B grooves, refreshing Stevie-esque neo-soul and hefty Stax-like horns, alongside robust musicianship and Platts’ butterscotch-flavored pipes, is a summation of a band playing in its finest hour. Although the experiments here are more contained than on some of the group’s prior discs, Golden Days hits all the right notes in its travelogue of throwback R&B and soul brought forward to 2018. And, in the process, this collection firmly establishes itself as one of the year’s finest releases. Highly Recommended.